… and a new Maine Aviation History Mystery is born! When I first merged my aviation archeology efforts with the Maine Aviation Historical Society in the late 1990s, the late Jim Chichetto filled me in on a mystery crash wreckage in the North Maine Woods near the Quebec border. The story was that several aviators had spotted wreckage in the woods north of Depot Lake. Legend had it that the wreckage was that of a “4 engined twin tailed Canadian bomber that crashed during WWII”. Jim had flown over the area with a fellow Society member and failed to spot any wreckage. Research to date had not turned up a “suspect” crash to research for more details. Solving a mystery crash like this one can be accomplished by several methods. One is to go into the field and locate the wreckage, and work backwards from markings, part numbers etc. For this to work, you either need a very small search area or a large amount of manpower and time. A square kilometer of Maine woods can be searched thoroughly by a team of 5-7 people in a typical day. If you are searching alone, or with one other person, a half mile off might as well be 100 miles. A second method is good old fashioned historical research. Newspaper archives, military records, and various historical societies and researchers are all good places to start. To be successful, though, you need to have a fairly narrow date range or aircraft serial number. U.S. Crash reports are filed by date but Canadian reports are filed by tail number, with a very incomplete finding aid available. The third method, and often the most effective in any wreckchasing endeavor is good old fashioned detective work- interviewing people who are familiar with the incident or have actually been to the crash site. With no real good leads to follow, I took a “shotgun” approach using all three methods. During my endless winter hours searching newspaper microfilm and rummaging through military unit histories I looked for any incidents that could possibly result in this story. There were only a handful of “twin tailed four engined” RCAF bombers of the WW II era. Expanding the suspects to twin engined, twin tailed bomber or cargo aircraft still revealed no good suspects. There were also numerous Lockheed Hudson and Ventura aircraft used for spruce budworm aerial spraying in the 1970s, so a thorough investigation had to rule out that one of them crashed near Depot Lake and would account for the “RCAF WW II bomber” wreckage sighted in the 1980s. Archives Canada, several Canadian researcher friends and all of my other paper research failed to turn up a single viable lead. Over the years I made over 100 telephone calls to interview woods contractors, Foresters, pilots, retired Forest Rangers, Game Wardens and anyone whose name came up as having any possible information about this wreckage or the incident. The sources that Jim Chichetto gave me were all secondary, having heard about the crash site or history of the crash from someone else. While I spoke to dozens of people that had heard some vague reference to the crash, very few had any usable details. One retired woods contractor from Quebec said that he had not been to the wreckage himself, but was familiar with the story and stated that other members of his crew cutting along the Maine side of the border had stumbled onto aircraft wreckage further north on a ridge near Little East Lake, very near the border. A quick look at a topo map revealed that Little East Lake is shaped very similar to Depot Lake, but smaller and oriented a little different. This turned out to be the first real lead that I got, but I did not know this at the time. Another old woodsman told me a second hand story about a search for a missing Canadian Airman during WW II in the area and that searchers had found an abandoned lean to shelter with a note from him stuck to a tree. He recalled being told that the Airman was never found, but could not remember where he had heard the story or any details that narrowed down the date or aircraft involved. Many other interviews seemed promising, yet as often happens in this type of research, turned out to be other crashes that I already knew about, including a WW II TBM aircraft that ditched in the general area during a budworm spraying operation in the 1970s. One very promising interview was with a WW II era Game Warden's widow in her 80s, who had a remarkably sharp memory. When I told her the basic story and asked if it sounded familiar, she immediately said “yes”. She went on to tell me that during a specific week in November 1944 her husband and a Warden from the adjacent district were gone for several days searching along the border for some aircrew that bailed out of a military bomber. She thought that they were American military. A quick call to Craig Fuller at AAIR turned up a B-17 incident in the region during the week in question. When the report arrived, however, the lead was another dead end. The B-17 had suffered severe icing and done an uncontrolled wing-over. The Pilot ordered a bail-out but after the 5 crew in the rear jumped, he regained control of the plane and made a successful landing at Presque Isle AAF, Maine. The crew had landed north of Mingan, Ontario. After tracking down a lot of second hand statements, I finally located a pilot that had seen the wreckage in the 1980s. He turned out to be not just a pilot, but one of the most respected in the region. He is a former B-52 Aircraft Commander and FAA Flight Examiner, as well as an officer in the local CAP Wing. He reviewed his maps and confirmed that the wreckage he saw was about a half mile NW of Depot Lake. He was told that it was a twin tailed, four engined RCAF bomber. I then asked him a question that later caused gasps from my pilot friends when they heard about it. “You asked him if HE was off course?!!! ?” I asked if there was any possibility that the wreckage sighted was actually further north, near Little East Lake. He said yes, that was possible. The wreckage was spotted while flying VFR cross country returning from a CAP exercise, so there was no exact position fix and the shape of the lake was the primary reason that it was cited as being near Depot Lake. In the early spring of 2001, I brainwashed a pilot friend of mine into taking me to the area for a low altitude air search. The ice was still on the lake and there were still a few patches of snow in the woods. We sighted nothing that appeared to be wreckage, but I noted the position of a few “suspect” light colored objects for future ground searches. Over the next two years, I made several long drives to the area and searched the swamp thoroughly, as well as an adjacent clear cut. I came up empty. One intriguing incident occurred at a North Maine Woods checkpoint. When I told the gate attendant what I was up to, she stated “oh you'll never find THAT”. When I asked what she meant, she steadfastly refused to talk with me any more! This mystery became a very cold case in my files until I got an unexpected break via the internet. In 2007 I was contacted by the Curator of the Alberta Aviation Museum who had been viewing my web site and had read the Depot Lake Mystery Bomber item. This prompted him to recall a chance encounter that he had with an RCAF veteran in a British Columbia shopping mall years earlier, While recounting his WW II service, he had told a story about flying an Albatross flying boat into a lake on the Quebec border so that a crew could remove the radios and classified material from a Digby bomber that had crashed nearby. His recollection was that it was in 1944. A Digby (USAAF Douglas B-18 “Bolo”) is neither twin tailed nor four engined, but it gave me a lead on a specific aircraft type that was worth following up on. A quick search of a friends web site on RCAF serial numbers lead me to only one Digby that crashed anywhere near Maine was Digby number 749 which crashed “near Riviere-du-Loup, Quebec” in November 1940. Riviere-du-Loup is 40 miles north of East Lake in Quebec and Little East Lake in Maine. A focused search of era newspaper articles and RCAF records revealed a story needing to be told and an explanation as to why the research had been so difficult. With the British Commonwealth at war with Germany in November 1940, and the U.S. neutral, the RCAF had mis-stated the crash site location to avoid the appearance of overflying Maine in violation of U.S. neutrality! “Digby” was the name given to Douglas B-18 Bolo aircraft purchased by the RAF and RCAF as war loomed in Europe. It was a twin engined bomber version of the DC-2 airliner and considered obsolete very early on in the war. In the early evening on November 16, 1940 Digby 749 of 10 Bombing Squadron RCAF took off from its home base of Dartmouth, Nova Scotia for an anti-submarine patrol over the Atlantic. Aboard was a 5 man crew and an additional Pilot/Squadron Wireless Officer as passenger. 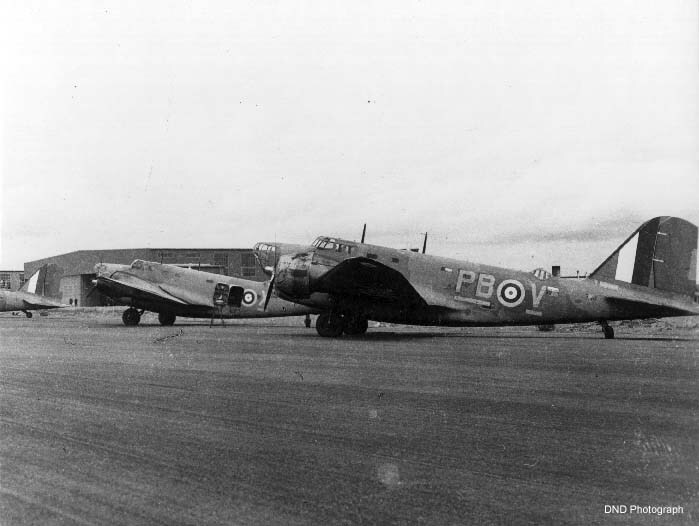 Due to unusually poor weather that threatened to close the aerodrome at Dartmouth, their patrol was cut short and they were ordered to return. Between 1800 and 1900 hours Atlantic Standard Time, 749 made several unsuccessful attempts to land in poor visibility and winds gusting to 65 mph. Since the severe weather system had also closed all other RCAF aerodromes in the Maritime Provinces , the decision was made to fly cross country to Montreal, 1000 miles to the west. Due to U.S. neutrality, 749 would take an indirect route and circle north through New Brunswick to avoid overflying Maine. At the time that the decision to fly to Montreal was made, 749 had approximately 8 hours of fuel aboard, enough to fly the long route around Maine and arrive with nearly an hour of fuel remaining. Digby 749 contacted the radio station at Blissville (Fredericton), New Brunswick at 0021 hours AST on November 17, reporting on course and on schedule. The aircraft, however, never arrived at Montreal within its fuel window and was reported missing. A few hours later, a telegraph message came in from 749's Aircraft Commander, Flying Officer JHU LeBlanc, at a Canadian National Railway station in the East Lake District near the Quebec-Maine border. He reported that the crew had bailed out of the aircraft as it was running out of fuel at 0110. LeBlanc was the last to bail out of the stricken plane and had landed, uninjured, within sight of a logging camp near the shore of East Lake. The logging crew transported him to the railway station so that he could report in. A court of inquiry would later conclude that the inexperienced flight crew had mismanaged their engine settings which resulted in excessive fuel consumption and eventual fuel starvation. The aircraft's radio compass was also non-functional and poor radio communications had plagued Leading Aircraftman Hollis E Howard, Wireless Operator, throughout the flight. One of the recommendations of the court was that more experienced pilots should be posted to the squadron. As the massive search effort for the remaining crew members began on both sides of the Maine- Quebec border, LeBlanc related the details of the bail out. Surprisingly, when the decision was made to abandon the aircraft over the dark snow covered wilderness, the crew discovered for the first time that they only had five parachutes for the six on board. Flying Officer JG Richardson, Copilot and Flight Lieutenant GF Clay, passenger, being the two lightest members, volunteered to jump using one parachute. The other four crewmembers bailed out using their own parachutes. Since LeBlanc had bailed out last, and the course of the aircraft was thought to be known, initial search efforts focused northeast of East Lake. Besides Digby aircraft from 10 Bombing Squadron and other RCAF assets operating out of from RCAF Station Rockcliffe (Ottawa), the search was joined by an army of woodsmen, forest rangers, game wardens, railroad workers, and law enforcement K-9 teams on both sides of the border. USAAC B-18 “Bolo” aircraft from Langley Field, Virginia joined the search on announced “humanitarian” grounds to preserve U.S. neutrality in the war. The first USAAC units would not deploy to Bangor Army Air Field until the following year. On 20 November, an RCAF crew in Grumman Goose CF-BQE sighted a parachute in a black spruce tree on a ridge south of East Lake and a man on the ground nearby. A ground search party was sent in and Leading Aircraftman EJ Benoit, 749's Rigger, was out of the woods with minor cold related injuries by daybreak the following morning. By 21 November, a total of three parachutes had been located, and Aircraftman 1st Class Elmer Johnson , 749's Fitter was located and rescued on the Maine side of the border near St. Pamphille, in the general vicinity of Depot Lake. The other parachute belonged to Leading Aircraftman Hollis E Howard, 749's Wireless Operator. Ground teams tracked him for several days and located at least two shelters that he had constructed but additional snow fall caused the trail to go cold. There is an oral history that a small team of Maine Game Wardens exchanged distant pistol shot signals with someone assumed to be Howard on the evening of 21 November, but were ordered out of the woods by a superior due to the start of a severe snow storm. On 23 November, the pilot of RCAF Grumman Goose 925 located the crash site of Digby 749 against ledges on a ridge near Little East Lake in Maine, just a short walk from the boundary line. Although LeBlanc had bailed out last, the crash site was within a few miles of where he landed. The other rescued crew and Howard's parachute were south of this area. It was now apparent that 749 was actually circling to the east while the crew was bailing out and LeBlanc had actually landed near where Flying Officer JG Richardson and Flight Lieutenant GF Clay had bailed out first with their shared parachute. This lead searchers to the theory that they had landed in East Lake and drowned. Large boats were brought in to break the ice building up on the lake and continue the search for them. The search was finally called off in early December with three aircrew still missing- Flying Officer JG Richardson, Flight Lieutenant GF Clay and Leading Aircraftman Hollis E Howard. More snowfall and the lack of any new search evidence made continued efforts fruitless. A Court of Inquiry was convened on 28 November and continued its investigation until 7 January 1941. The wreckage of the Digby on the U.S. side of the border was problematic because it could suggest to the axis powers that British Commonwealth forces were using neutral American airspace in their war efforts. This was dispensed with by officially listing the crash location at Riviere-du-Loup, Quebec. Richardson, Clay, and Howard were listed as “missing presumed dead”. In the spring of 1941, woodsmen located the bodies of Flying Officer JG Richardson and Flight Lieutenant GF Clay tangled in the shrouds of their shared parachute against a logging boom near the outlet of East Lake. They had apparently broken through the thin ice on the lake on impact and drowned. The fate of LAC Howard remained a mystery for three and a half years until June of 1944 when persons unknown discovered human remains with RCAF equipment/clothing somewhere near the East Lake District. On 3 June 1944 Flight Lieutenants Hall and Gignac, based at RCAF Station Ancienne Lorette QC (Quebec City) returned with the bones of an airman believed to have be one of the three missing airmen who had parachuted from Digby 749 three and a half years earlier. Although there was some controversy initially based on possessions found with the body, the bones were eventually identified as belonging to LAC Howard who was returned to be buried in his home town of Aylesford, Nova Scotia. There is no doubt that this is the mystery bomber wreckage that Jim Chichetto and other researchers heard about. However, the story of LAC Howard creates another Maine aviation mystery that (at least in my mind) must be further researched. LAC Howard's date of death is listed as 29 November, 1940, over a week after the crash of Digby 749. In a letter to Howard's father in 1940, his Squadron Commander relates the extensive search efforts that were conducted for his son and specifically states that he survived the bail out, dying later in the wilderness. A reference is made to “several lean-tos” found that were presumably built by Howard in his effort to survive the harsh winter conditions. This later became a key contention in a dispute between Howard's next of kin and a life insurance company that failed to pay out because the policy excluded death due to aircraft accidents. The RCAF produced affidavits that he had actually died of exposure and the benefit was eventually paid. Much of the written record of LAC Howard's survival efforts and remains recovery support the oral histories that I collected during my research, of an aircrewman leaving behind notes and exchanging pistol shots with Game Wardens. I have been unable to locate any RCAF records or reports about the actual location and recovery of his remains. His service record only includes a letter questioning the tentative identification of his remains, but contains no location information. A search of Maine, Quebec, New Brunswick and Nova Scotia newspapers of June 1944 yields no articles about his remains being found and no obituary update. This all leaves one important historical question unanswered. “Which side of the border did LAC Howard die on?” If he died in Maine, he would be the first military aircrewman to die in a Maine mishap. Current Maine history is that the four members of a B-18 Bolo crew that crashed near Lee in November 1941 are the first military aircrew to die in a Maine crash. If I ever attain my goal of a permanent monument to all of the military aircrew who died in Maine between 1941 and 1989, it would be important to add his name as the first, if he did die in the woods of Maine. The best possible resource at this point would be to locate descendant's of LAC Howard and see if their family oral history or preserved papers give any further insight into this matter.